Beta Vulgaris. 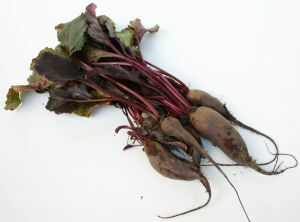 There are two sorts, the white and red Beets. The common white Beet has many leaves next the ground, somewhat large, and of a whitish green colour. The stalk is great, strong, and ribbed, bearing many leaves, almost to the very top of it. The flowers grow in very long tufts, small at the end, and turning down their heads, which are small greenish yellow buds, giving cornered prickly seeds. The root is great, long and hard.